Let’s run through the day; wake up everyone; take out the dog; wake up everyone; turn on the water for tea; wake up everyone; take a shower; one last call to wake up everyone; make breakfast; encourage teenagers to make lunches; do some dishes; switch the laundry; answer quick emails; gather items for the day; remember to get myself ready (make-up/hair/professional clothes—not slippers and stretch pants); drop of at the middle school; drop off at the high school; drop off at the university; park and hustle to the Department of Public and International Affairs for my Graduate Teaching Assistant duties; pick up at the middle school; pick up at the high school; pick up at the university; drop off at theatre; drop off two at home; drive back to the university; attend Public and Policy Analysis evening class; go home; rinse and repeat! Make note–this evening was minus guitar, PTSA meetings, eye appointments, or the multitude of other items that make their way onto the calendar. When I list it all I think I should be suffering from a massive breakdown, which could be something sneaking up on me, but honestly I do not feel overwhelmed! I think it has to do with making the decision to pursue something that makes me “come alive” and leaves me optimistic that I am on the path of having the fulfilling (personally and financially), career that I have longed for. By bringing it all together, I am keeping it all together. How ironic does that sound? When you are doing what you love life just feels more manageable. So to keep up with the pattern of busy and the goal of success……I spent last night putting out this email……. I hope this email finds you happy (or sleeping) tonight. 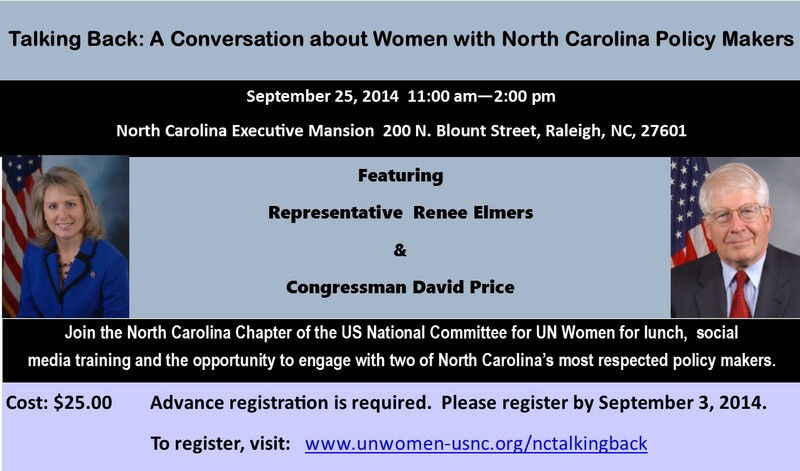 I am reaching out this evening to introduce UN Women-Wilmington, part of the NC USNC UN Women chapter. You are included in this email group because either, I met you at the International Student Welcome Pool Party; you are in my Volunteer Management course with Dr. Brudney; you kindly took a moment to stop by the Coastal Carolina UNA-USA table at the UNCW Involvement Fair; you are a parent of a girl who might be interested in learning more about GirlUp; or at some point you were an engaged member of ONE Wilmington while I was the Congressional District Leader from 2010-2013. Whatever the reason, if you would like to be removed please do not hesitate to ask. My disclosure statement is that I never place you on a listserv (I will give you links to do that yourself if you are interested) and I am a very busy grad student and mom of three teenagers, so will be extremely mindful of your time with the content of the email. I strive to provide information in bulk allowing you the choice to read, take action, give, or attend events on your own accord–there is never pressure. What is most important is that you know I am available whenever you feel the desire to speak up for women and girls around the world, to give direction in choosing the most effective way to advocate! With housekeeping out of the way, I would like to share with you some upcoming events and opportunities to learn more about the incredible work of UN Women. If you have talents to offer in planning, organizing, or being a vibrant presence at an event please respond to this email and we can talk more. My contact information can be found below. *Thursday, October 2, there will be a UN Women-Wilmington coffee shop meet up at Port City Java, 132 Racine Drive (next to Khol’s), at 2:00 pm. It will be a relaxed way to meet and then discuss how we can engage our local officials to keep women and girls a priority in their decision making. *Saturday, October 25, there will be a meeting for GirlUp at the Northeast Public Library. The Wilmington GirlUp club is facilitated by my daughter, Isabel, and focused on middle and high school age girls who want to become advocates for girls around the world. If you are interested in learning more please email Isabel, isabel.ibec@gmail.com. *Friday, November 21, there will be a UN Women-Wilmington event around the topic of ending gender-based violence in conjunction with a Thanksgiving food drive. More details for this to come. *In December meetings will begin for planning and organizing the 6th Annual UN Women Walk to End Violence Against Women and Girls at Hugh MacRae Park that is held every April. We are accepting walk committee members to be a part of this rewarding event. I can honestly say it is one of the best committees and events to be a part of–we would love to add some new faces:)! Thank you so much if you have read this far. I appreciate your interest and will be available for any questions you might have. I whole-heartedly believe that together as ONE we are shaping a better world. I always stay focused on the positive proof of progress and raise my voice when I see the injustice. I hope you are inspired to join me.